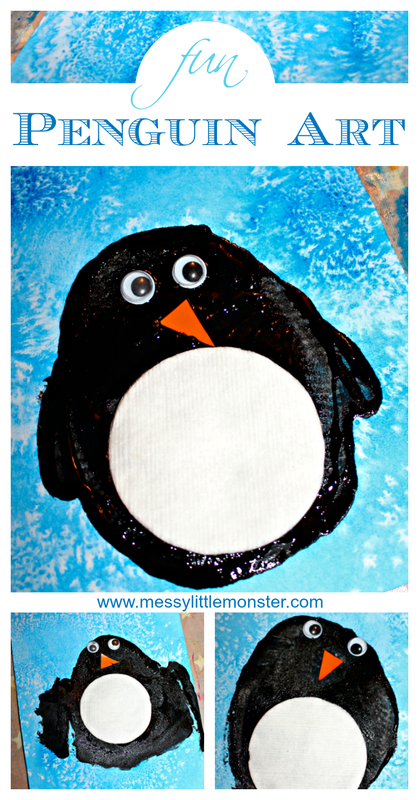 You won't believe how easy this kids penguin craft is to make! 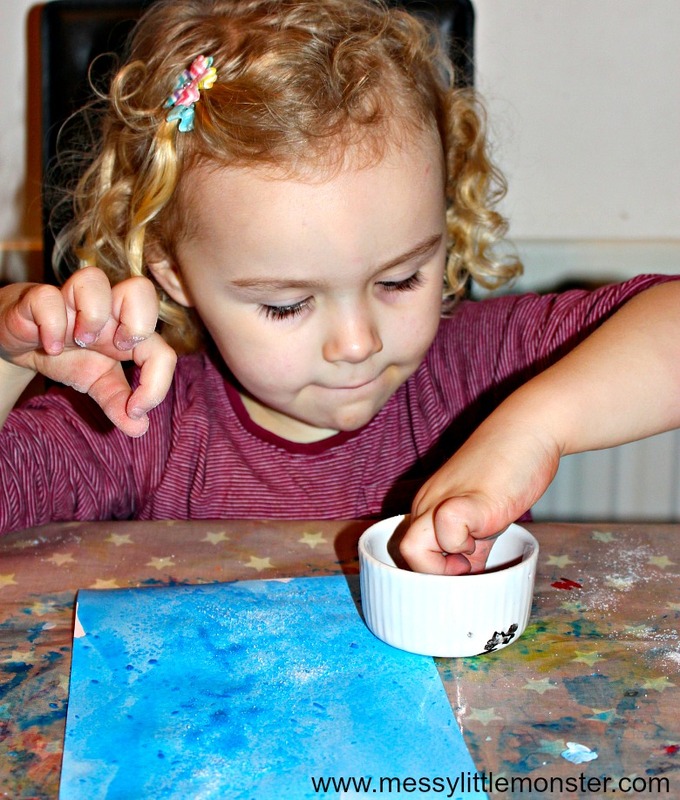 Young children will love the fun art process that we have used to make the icy background and you can't beat a bit of potato printing! 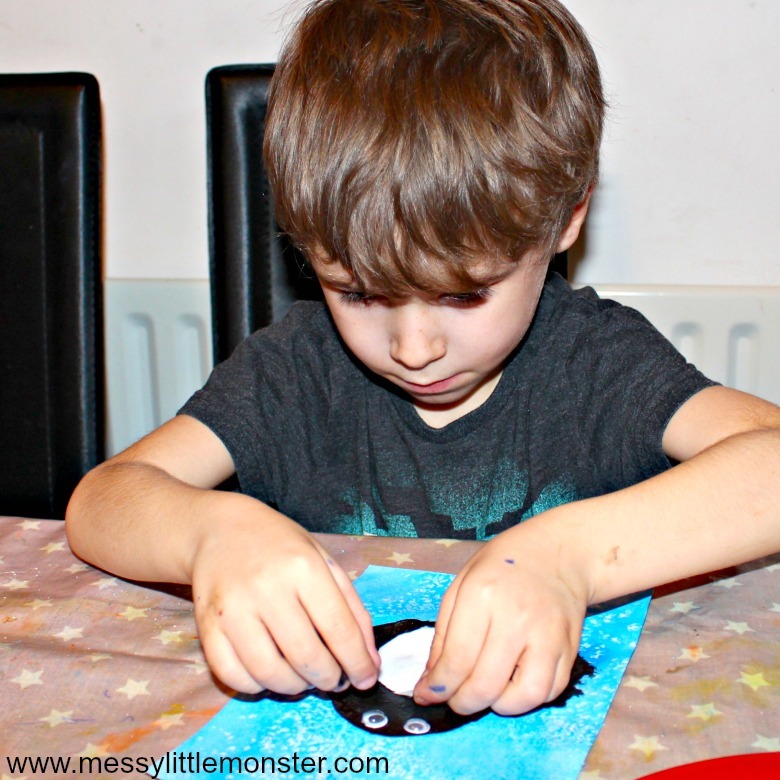 The art ideas we have used to create the penguin are easy enough for toddler and preschoolers, but this penguin craft is suitable for much older kids too! The great thing about this activity is that each penguin painting will look totally unique. 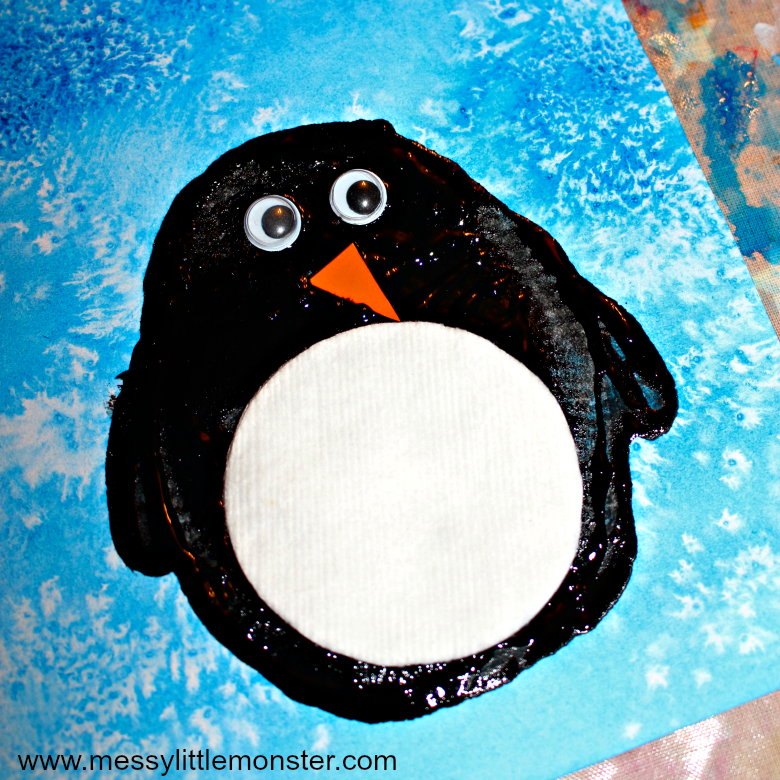 Penguin crafts are perfect for a winter or antarctic themed project. 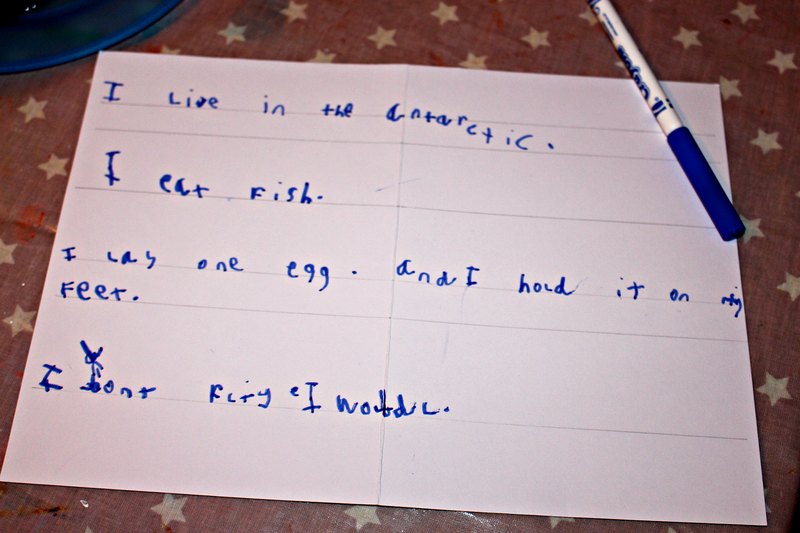 Harry (age 6) is learning about penguins at school so he was keen to continue learning about penguins at home. He turned his penguin craft into a mini information book about penguins. If you are doing an antarctic animal topic we have a set of arctic animal colouring pages to download that you might enjoy. You might also like to take a look at our other penguin crafts, our salt dough footprint penguin and our fingerprint penguin on a wood slice. Penguins always seem to appeal to young children and toy penguins can really enhance sensory play. We had lots of fun playing with penguins in ice and introducing them to our homemade fake snow. A bit more messy but lots and lots of fun is including toy penguins in an oobleck small world. Todays potato print penguin craft was much easier than it looks to create, but the children were really impressed with their completed penguins and they enjoyed the art process. 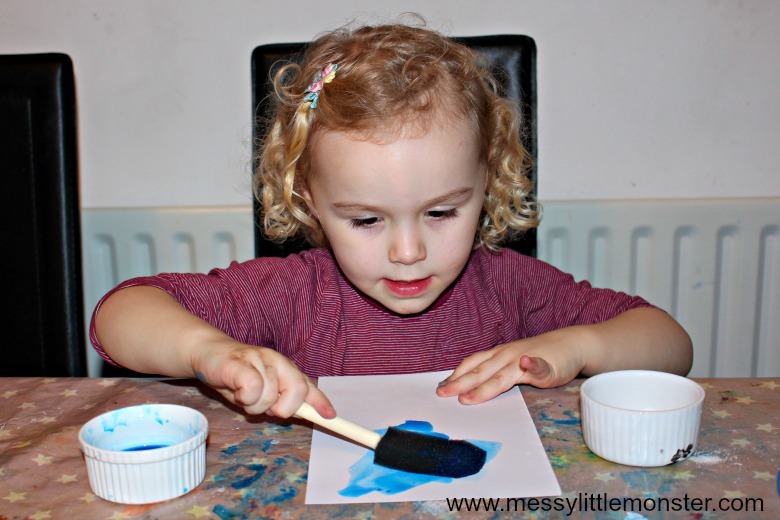 Begin by covering a piece of white card with blue liquid acrylic or watercolour paint. Be nice and generous with the paint, you don't want it to dry too fast. We found that using a sponge brush made this much easier and quicker. 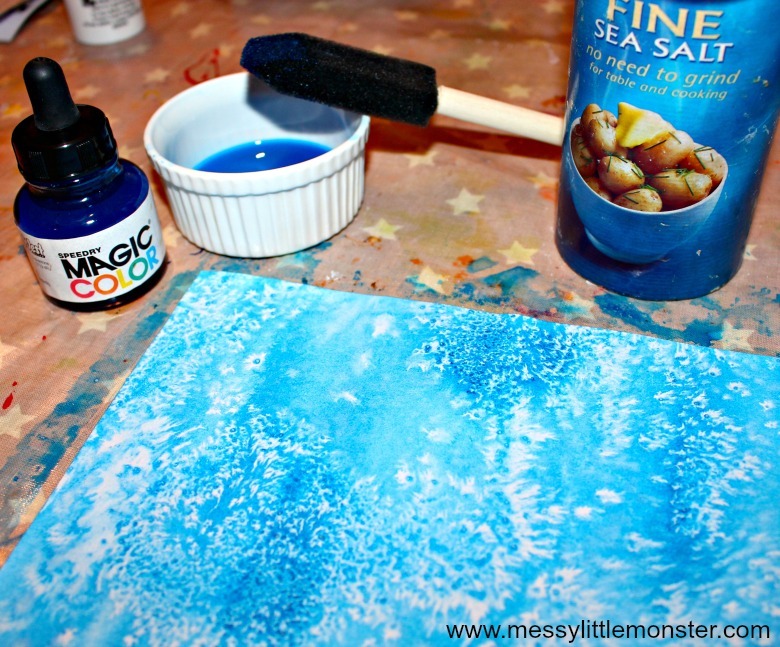 Once the card is covered in wet blue paint sprinkle sea salt over the card and then leave it to dry. As the paint begins to dry you will see some beautiful patterns start to appear on your piece of card. These patterns are totally random and unique and they create a perfect icy sky for the penguins. Once the paint has dried brush the sea salt off the card. Take a potato and cut it in half, this will be used to print the penguins body. I always like to cut a handle into the potatoes to make them easier for little hands to handle and print with. 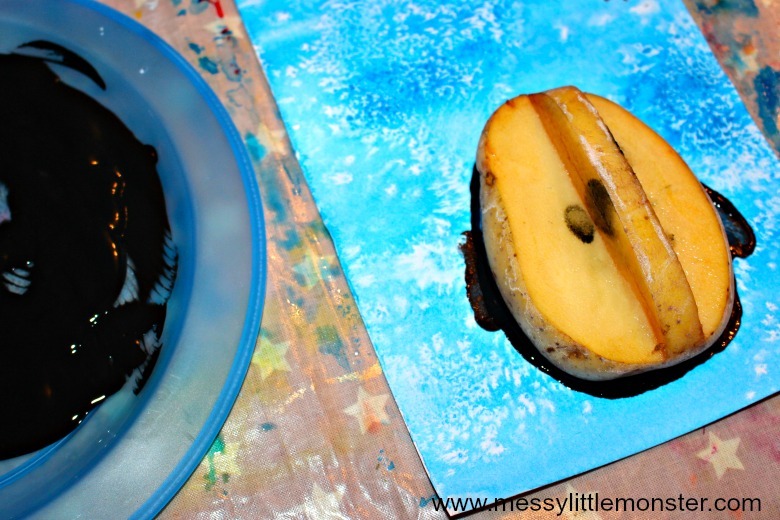 Dip the potato into black paint and then onto your icy background. Make sure there is plenty of paint on the potato before you begin and press down hard so that you make a really good potato print. You might like to leave the penguins body as it is, just as an oval shape, or you might like to paint on flippers. 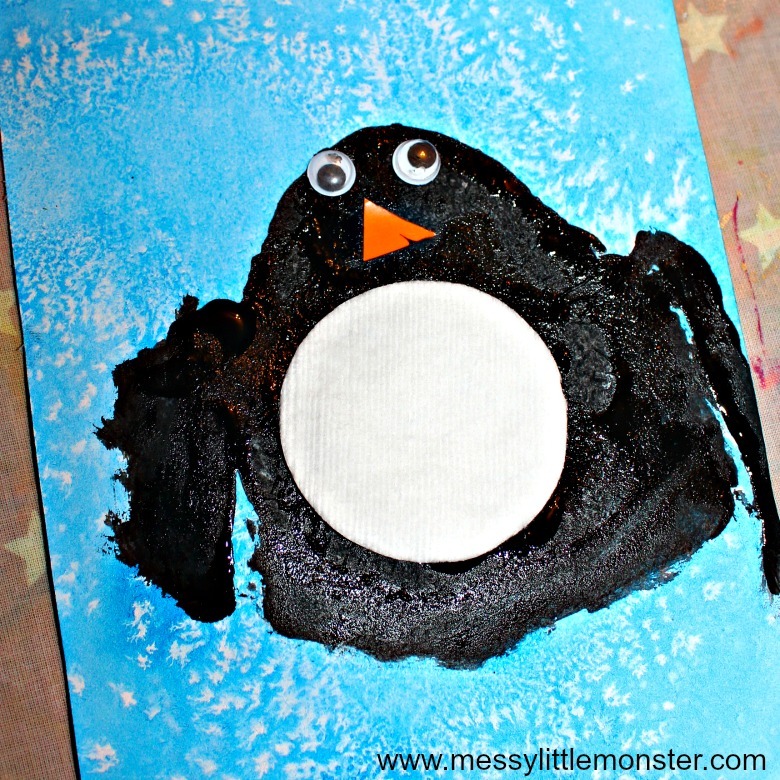 While the paint is still wet from the potato print place a white cotton pad onto your penguin shape as a tummy. Above the white tummy add two googly eyes and a small triangle of orange card as a beak. 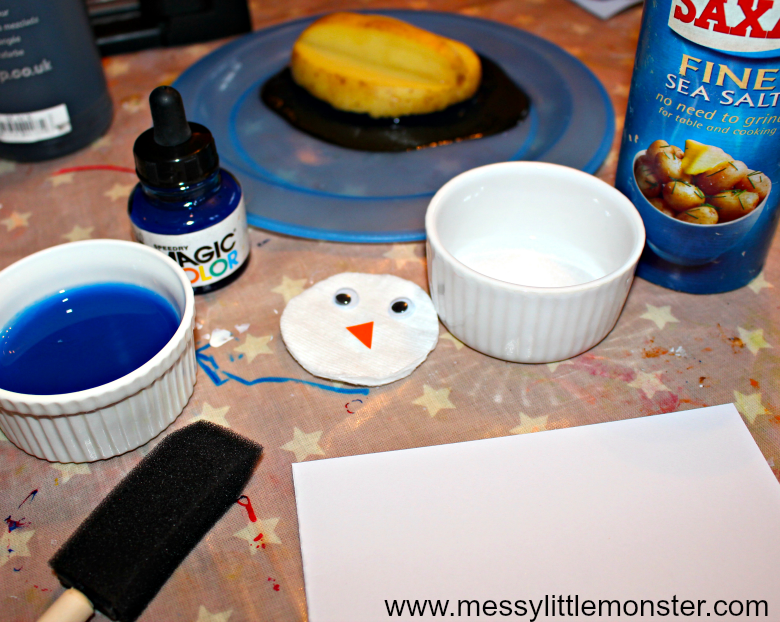 You won't need any glue, they will stick straight onto the paint (as long as you used plenty of paint when doing your potato print). There we have it! Your penguin craft is complete. How easy was that! Take a look at our completed penguin artwork below. Each penguin looks totally unique, like he has his own personality. 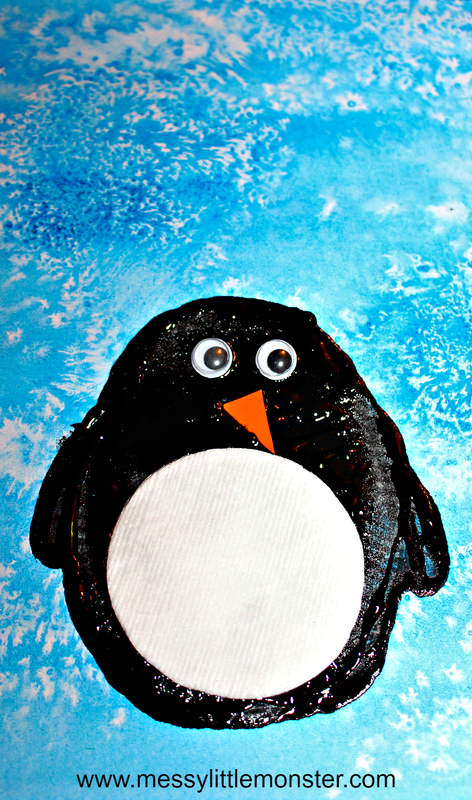 It would be so fun to make lots of potato print penguins on a larger piece of card to see how different they all look. 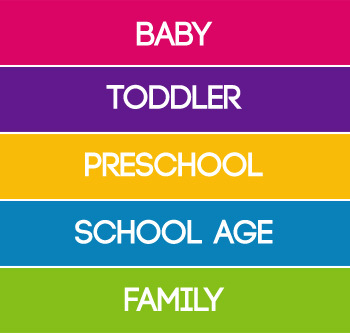 Doing this craft as a class project could be fun too as each child's artwork would look different. Once we had completed our penguin craft Harry turned his painting into a fact book about penguins. He wrote a few penguin facts onto a folded piece of card and then he stuck his painting the the front. We all really enjoyed making our penguins and we hope that you do too. 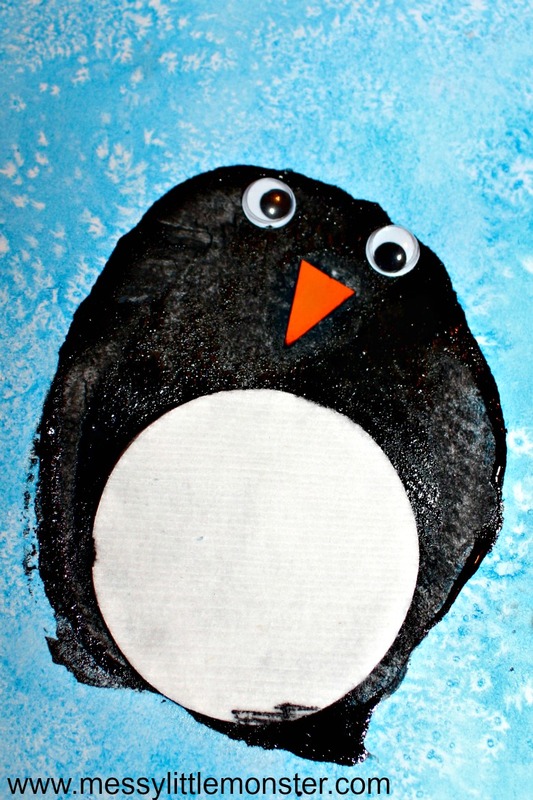 Here are a few more fun winter art, craft and activities to try.